Gravel is the all-purpose answer to your landscaping needs. It’s easy to use and easy on your wallet. We sell over 20 varieties of gravel and sand, so you know you’ll find something that fits your needs. Looking to enhance your gardens, walkways or pool? Our client service representatives will be happy to help you find it. And when you buy where the contractors buy, you know you’re getting the best deal. Get Your Free Stone Consultation! We sell most of our gravel and boulders to contractors. They rely on us for the highest-quality product at the lowest prices. And they have for 80 years. Why? Because our commitment to selling the best gravel and stone is unparalleled in the region. We are always happy to partner with our clients and put their needs first. Since 1938, we’ve done just that. We love gravel for its versatility. Whatever landscaping issue you have, we can probably solve it with gravel. Is your parking area becoming a muddy rut? A gravel driveway is easy to install and inexpensive. And it will look great for years. Gravel withstands heavy loads without cracking or sinking. Our ¾-inch Blue chip or CR6 are perfect for the job. They’re utilitarian, they compact well and they’re easy on your wallet. And, if you install a deep enough layer, you won’t have to worry about weeds. But they’re also porous so you don’t have to worry about drainage or mud. Whether you need a long driveway all the way from the street to your garage or a small side lot for extra parking, your best bet for a lasting solution that saves you money is gravel. Do you want a landscape that looks great without your help? Decorative gravel fits the bill. Decorative gravel gardens give you a customizable look with a wealth of color and stone size options. Plants pop on a background of our ¾-inch Seneca which is often time used instead of mulch. A gravel garden will end your weed problems for good. Using landscape fabric and at least 2 inches of gravel, you can count on weeds dying in their infancy. Seeds won’t make it to the soil, and sunlight won’t feed pesky plants you want to keep down. Gravel can help your established plants thrive. Stones retain heat, keeping the soil warm and nurturing. And with a gravel garden, soil erosion and compaction aren’t issues. A gravel pathway transitions you from manmade artificiality to the natural splendor of your landscaping. It’s the connective tissue that runs through your outdoor space. The walkway gives you easy access all the wonderful features of your landscaping. It directs guests and provides sight lines to focal points. Build something comfortable and stylish that won’t break the bank. Expand your useable space and mitigate mud and drainage issues. Gravel walkways can do all that and more. Our Pea Gravel is soft underfoot, yet heavy enough to remain in place with very little maintenance. A long gravel path helps with drainage as well. If you want to add gravity to your walkway, line it with boulders. Water issues can cause you a lot of headache. If you don’t take care of poor drainage, you can wind up with flooding, wet basements or even foundation damage. Gravel solves your issues before they start. With our 2-inch Wash Gravel around your entrances, walkways or patio, water flows away from problem areas before it pools. If you’re building a French drain, gravel is a critical component. French drains sweep water from problem areas where soil erosion or poor grading cause pooling or lackluster drainage. To do that, the drain must be covered with material that looks like a natural part of the landscaping, but allows water to trickle into the permeable pipe. If you want an even more natural look, you can make a dry creek bed from gravel and boulders. The rustic look disguises its true drainage function. A well-placed boulder at the top can even obscure the sources of the water, giving the creek bed a magical quality when it rains. Boulders make bold landscaping statements and protect your property, all without the maintenance that comes with plant landscaping. Landscaping boulders can stand alone in your garden or accent your plants with no maintenance whatsoever. Instead of struggling to keep temperamental ferns alive, why not drop in a Lake George slab? Need a focal point for a small flower garden? A Pennsylvania Boulder will dominate the space without detracting from the colorful blooms. 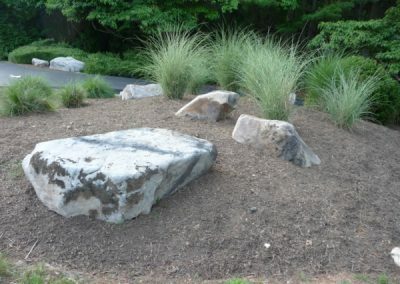 Boulders also define your landscaping with a striking look that you can’t get with other features. An eye-catching boulder perimeter will push your koi pond to the prominent position in your backyard. Line your stone steps with our PA Boulders for standout stairs. Construct stunning stone waterfalls and stairs with our Pennsylvania Boulders. Your stone features will look like they’ve been part of the landscape for centuries. And boulders are sturdy enough to withstand constant running water or foot traffic. You can enjoy your new waterfall for decades without maintenance. Boulders can fortify your buildings without giving visitors the feeling that you’re too sequestered. Where a large fence or gate might turn people off, boulders blend with the environment. A boulder next to your mailbox will ensure it never gets ruined by a careless driver. Several vertical boulders in front of your business form a protective barrier against runaway cars. We see a lot of do-it-yourselfers at our stone yard. They’re shrewd buyers, and they want the biggest bang for their buck. For these weekend craftsmen, gravel works great. Some landscaping materials require expert installers and specialized tools. These things can cost you big-time because labor adds up fast. Seasoned DIYers know you need to keep things as simple as possible to keep costs down. Do you need a long driveway or walkway? Gravel is often the only reasonable way to cover a ton of space. Costs for a long asphalt or concrete driveway would quickly get out of hand. A gravel driveway will cost you a fraction of what those materials and installation would cost. Gravel is a “set it and forget it” installation. With other materials, you need to mix, cut, cure, carefully measure. You might need to rent special machines like power trowels and floaters. You end up way out of your comfort zone, and errors are costly. Why bother with all that stress? For a gravel project, dig a hole, set your edges and pour it in. Let it sit for a week, and you’ve got a feature you’ll love for decades. Grading is probably the hardest part. For boulders, just lay them down where you want them. We can even take the hassle out of transportation with our delivery service! We can either dump your gravel in a pile or deliver it in a bulk bag that can hold up to 3,000 lbs. It takes the pain out of surfacing. And if you have any lingering questions, our client service reps are happy to help. Gravel and boulders are some of the most durable landscaping materials money can buy. If you maintain them properly, they can last a lifetime. Your gravel driveway will be heavy enough to stay put through harsh storms and driving winds. At the same time, the material is porous, so your gravel walkway won’t wash away when rains get heavy. Water flows right through. Using durable materials saves you big in the long run. Your concrete driveway might develop cracks over the years. A metal French drain could rust out in time. But a correctly maintained gravel driveway will look great for a long, long time. A dry creek bed made with gravel and boulders will keep your lawn free of flooding for the life of your home. You spend less money replacing your features over time. Your gravel driveway will be heavy enough to stay put through harsh storms and driving winds. At the same time, gravel is porous, so your gravel walkway won’t wash away when rains get heavy. Water flows right through. Don’t want to think about your landscaping? Stone doesn’t need maintenance. Who likes weeding a garden? With gravel and landscape fabric, weeds don’t get the sunlight they need, and seeds can’t penetrate to the soil. Can’t grow a plant to save your life? A boulder looks great, and it doesn’t need you to care for it. If you graded correctly, your gravel features shouldn’t get potholes and divots. But if they do, you can just fill them in with more gravel. If the pathway starts looking thin, simply spread some more on top of it. It’s the absolute simplest landscaping you’ll find. We sell an enormous variety of stones. We have dozens to choose from, and we have the expertise to find specialty items on request. No matter your project, we can help you tackle it. Our client service representatives know what kind of gravel will work best for any application. We have a wide range of colors to complement your home, your garden or your plants.